Warning. This is not for the faint of heart or those concerned about artery blockages in the near future. This is full force, clotted cream ice cream. The boyfriend and I just returned from an amazing summer vacation in London and the South of France. While we were in London we were on a mission to find raspberry clotted cream ice cream. The boyfriend has memories of it from summers spent in England with his father when he was a kid. I wasn't sure if it was really going to be that good or if, perhaps, the Atlantic Ocean separating the boyfriend from this magical confection had made the memory grow a bit fonder. Either way, I was determined to help him find it, even running in heels one night from a tube stop in hopes of getting to Sainsbury's before closing, only to find, eight blocks and one blister later, that the person on the phone had given us the wrong closing time and they had in fact already been shut for a few hours. Sadly, we never did find the clotted cream and to try and ease his disappointment, I promised to make some for him as soon as we got home. Well, we've been home almost a week now and I figured it was high time I made good on my promise. So here it is. My attempt at recreating something I have never eaten nor laid eyes on. To boot, it's a something that fond memories have probably made much better in imagination than in practice. But I set out, determined to succeed. One huge, $15 jar of clotted cream later I was thrilled when he took the first bite and said,"this is it! Maybe a little less cream, but this is it." I quickly reminded him that you can't really get rid of the creaminess of clotted cream (nor would you want to) and besides, after you take a few more bites and really get the tartness of the raspberries, they cut the heaviness of the cream for a really well-balanced flavor. If you want to cut the heaviness even more, use milk instead of cream and let me know how it goes! Place half the raspberries in a small saucepan with a 1/2 cup of the sugar and the water. Reduce down over medium low heat, stirring occasionally while you make the ice cream. Place egg yolks and remaining 1/2 cup of sugar in a stand mixer fitted with the whisk attachment and mix on medium until expanded and light yellow in color. Meanwhile, heat the heavy cream in a medium saucepan until just before simmering. With the mixer still running, add a tiny bit of warm cream to egg mixture until tempered. Add remaining cream slowly. Once fully incorporated, place egg and cream mixture back in the saucepan and heat over medium low heat to cook the custard, stirring regularly. Rinse the stand mixer bowl and whisk. Once the custard has thickened, return it to the bowl of the stand mixer with the clotted cream and mix until clotted cream is fully incorporated. Freeze mixture according to ice cream maker instructions. Add remaining raspberries to the reduced raspberry mixture and let cool. When the ice cream is finished add the raspberry mixture to the ice cream machine and let it go for a rotation or two. The goal here is to get it somewhat mixed in, but nowhere near fully incorporated. Freeze slightly and enjoy! I came very close to embarrassing myself by licking the screen there. 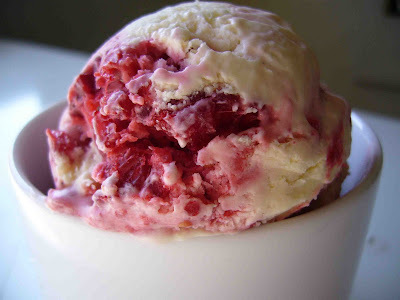 Home made raspberry clotted cream icecream? That looks fabulous. This sounds GREAT! Though my children aren't huge fans of raspberries they are serious lovers of ice cream. Where did you find the clotted cream?